I used to work with a guy who was in Mensa, the "High IQ Society." He had a plaque over his desk and everything. It was super impressive. I remember always thinking, "Man, I wish I was in Mensa." Now, thanks to Square Enix's Mensa Academy, I can work towards attaining that goal. The game, which is a series of tiered "brain game" minigames, is a fine way to keep your mind sharp. It's already out on PC via Steam and it comes to iOS today. I can't attest to whether it will help you get into Mensa (yet), but it is definitely a fun way to stretch your brain out. The games are all presented in a fun, colorful style, with different stage-sets popping up depending on the kind of game you're playing. You'll be tested on language mastery, math, and even some tricky logic puzzles like that one in Die Hard with a Vengeance where they have to measure out the specific amount of water from the mismatched water jugs. 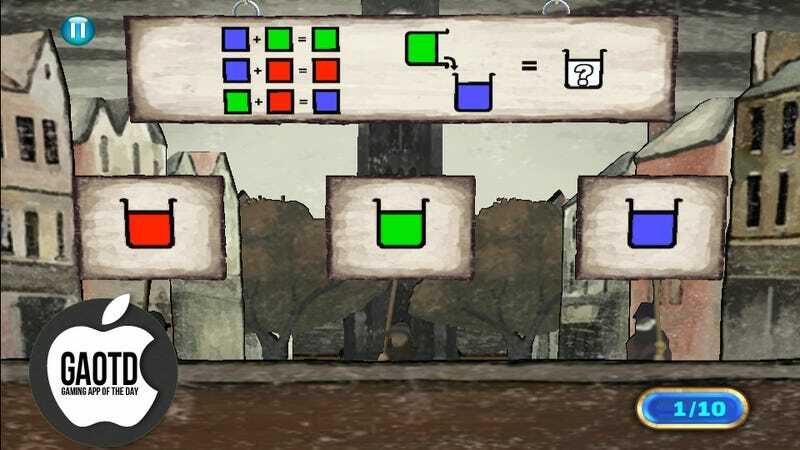 The puzzles are smart and surprising, and frequently will make your brain move left when it's used to moving right—math questions will ask you to fill in the plus/minus/equal signs, rather than the numbers. Word-puzzles will remove not one but two letters, place them in a reversed order, and ask you to choose the right pair. Silly/accidentally-offensive word choices notwithstanding, Mensa Academy is a great deal of fun, and features a huge variety of fun brain-games. Maybe if I play it long enough, I can finally hang a Mensa certificate above my desk. Or you know, just print out a fake one and hang it up anyway.